Embroiderers from around the world have joined forces with a British artist to create a single red dress in an international textiles project called Barocco. The decade long UNESCO supported global embroidery collaborative is the idea of artist Kirstie Macleod. After obtaining funding from the British Council in Dubai, Kirstie contacted textile artists from around the world, including Kenya, India, Tobago, Afghanistan, Vietnam, Egypt, Palestine, Dubai and the United Kingdom, to unite their skills and cultures. Since 2009 the dress has been travelling around the globe being continuously embroidered on and added to by more than 50 participants. At the beginning of this year, Kirstie put an appeal out on Facebook asking for international textile individuals or groups who would be interested in joining the project. This is where ladies of the Kenya Embroiderer’s Guild and I joined the venture. 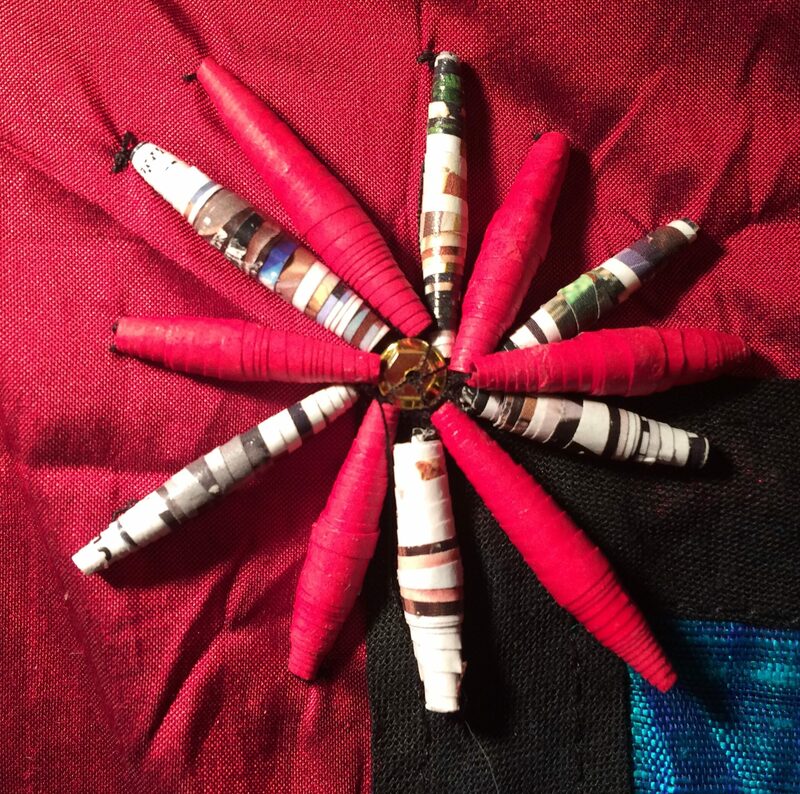 I contacted Kirstie and told her that I was an artist and a member of the Kenya Embroiderer’s Guild and that we would love involved with the red dress in some way. After a positive response, Kirstie sent us a section of the red dress, measuring 200cm by 40cm. The only instructions we had was to create something which would embody the cultural identity of Kenya. Collectively the Guild came up with the design of a line traditional Masai women completed using embroidery and applique. Members of the Guild who wanted to be involved took home a stencil and were given up to two months to finish their individual design – in whatever stitch or style they chose. In total 22 figures were completed and returned to me and using my manual Butterfly sewing machine I set to work on putting the panel together. Here is a video of me sewing the individual panels onto the red material, using my manual Butterfly sewing machine. After adding individual panels and bias binding to the red dress material, we wanted to add some beads and sequins to decorate the border. For this, we teamed up with Dorcus Beads, a micro-enterprise initiative group of the Women of Eastern Kenya. The women, who are all in someway affected by HIV/AIDS, made the beads from recycled paper. The income is used to support their own children and others who are vulnerable to AIDS. Some of the women from Dorcus Beads joined the members of the Kenya Embroiderer’s Guild for one of our monthly meetings to teach us how to make the beads, using paper, glue and a cocktail stick! These were some of the beads we made, sewn on the red material, in the shapes of flowers. And here is the finished panel made by the women from the Kenya Embroiderer’s Guild. Ali: What gave you the idea for the red dress? Kirstie: I was commissioned by Art Dubai to create a work of art – so as always I looked into the textile heritage of the country. It played a large part within the Silk Trade where richly coloured silks were traded – apparently red was a favourite. The rest of the idea, the story I now see as an articulation of part of my own identity. I grew up and lived abroad in many different countries – Venezuela, Barbados, Nigeria, Japan…to name a few. I am fascinated with different cultures and also the many key elements of living which are the same world wide. I wanted to create a piece that would evolve over time – and would also involve many different people in conversation. And so Barocco was born! Ali: You have worked with many diverse groups of textilers around the world, where have these groups come from and how did you make contact them? Kirstie: Yes. Some have been through contacts I had whilst while living and working in London, many through friends and lots through the internet – google, instagram and facebook. Ali: Where does the word Barocco come from which describes the project? Kirstie: Barocco is an old Portugese word meaning ‘a rough or imperfect pearl’. She said that our panel would be added to the bottom skirt section of the red dress. Barocco is due to be finished in 2019. Kirstie hopes that when it is completed it will be displayed in the Victoria and Albert Museum in London. What a stunning work of art ! Well done everyone. That took love and dedication. What a great idea, and such a beautiful piece of the whole that has been counted by your group! I would love to see the finished project! Thank you for the article Ali.